Sir William Waller called his defeat at the Battle of Roundway Down, the most heavy stroke that ever befell him. He also said it turned victory into mourning and glory into shame. Indeed his loss in July 1643 was both dramatic and unexpected but what exactly happened has posed questions to historians for many generations. 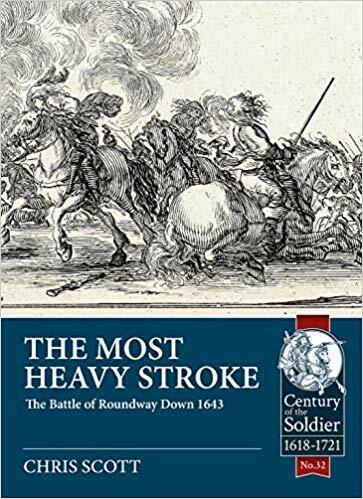 For years the same old solutions as to why Waller's combined-arms army was overcome by a cavalry force of less than half its numbers have been discussed, but with little variation. They all appear to hail the experience of the vaunted Oxford Horse, the idea that the parliamentarian Horse began their fights stationary, the personal skills of Wilmot and Byron over those of Haselrig and Hungerford, and the cowardice of the parliamentarian Western Horse. These factors are probably correct in some measure, but this volume says there are two more, perhaps even greater reasons for the collapse of Waller's mounted troops. The text describes how the tactics of the day put Waller's cavalry at a decided disadvantage and that Wilmot having understood the lessons of Edgehill was able to make full use of what he saw. The book also argues a case that perhaps the ostlers and grooms of Oxfordshire contributed more to the royalist victory than has hitherto been acknowledged. The Most Heavy Stroke is full of new information and new ideas, and offers a new interpretation of what occurred and why. Not only how it happened, but where the fighting actually took place has also over the years brought several interpretations to the fore. However, many previous writers seem to ignore several witnesses whose testimonies render their own basic deployment premise somewhat flawed. The Most Heavy Stroke combines what accounts say of movements and eye-witness terrain descriptions with knowledge of period practice in a deeper study of both battle and battlefield than has been hitherto undertaken, turning agreed previous positions of both armies on their head.